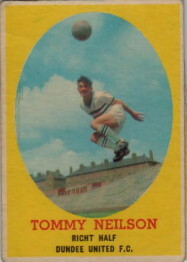 Younger brother of Jackie and Steve, who played for St Mirren and Rotherham United respectively, Tommy began his career at junior level for Arniston Rangers before signing for Hearts in 1953. He failed to break into the first team at Tynecastle, and moved on to East Fife in 1957. He made over 50 appearances for the Bayview side, and although he was never known as a regular scorer, he once back-heeled a goal against his former club Hearts in a Scottish Cup tie. 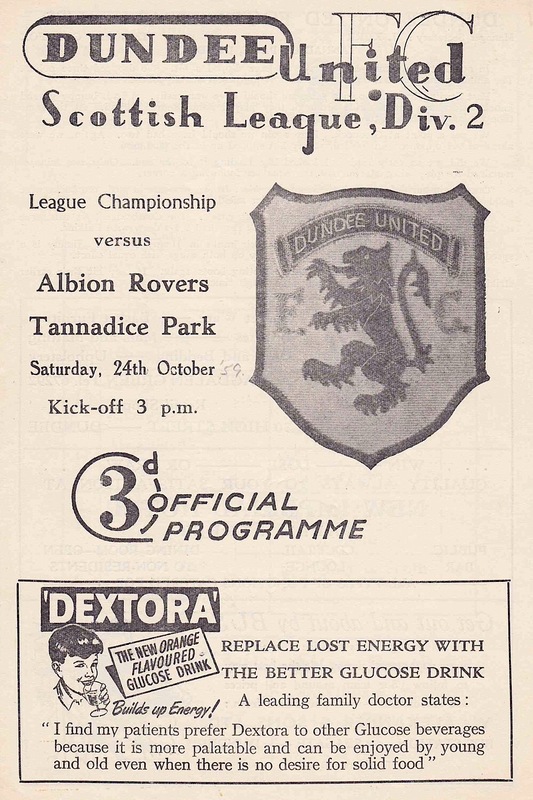 A boilermaker by trade, Jerry Kerr brought him to United in October 1959, making his debut two days later against Albion Rovers at Tannadice. Settling into the right-half position, he became an important part of the team that won promotion to the First Division at the end of his first campaign. Tommy, now a full-time player, was an ever present in the Club's first season back in Division One, and was rarely out of the side over the next few years, captaining the team for a spell, and could play at inside-forward when required. During this time, the Club appeared in their first ever domestic semi-finals in 1963 and 1964, and reached the final of the short-lived Summer Cup competition in 1965. 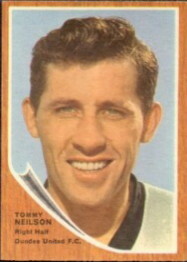 Tommy was part of the United team that finished in fifth place in 1965-66, the Club's highest ever league position at the time, and made their European debut the following season. In late 1966 he was in the United team that was victorious against Barcelona in Spain in the Fairs Cup, and also played in the return leg at Tannadice as the side recorded two of the Club's most famous victories. He also played in both legs against Juventus in the next round, and travelled to America as part of a sixteen man squad that represented Dallas Tornado in the United Soccer Association in the summer of 1967. In his final season with United, 1967-68, he was unable to retain a first team berth and asked for a transfer in October 1967. Three months later, he had a short run in the side but was released in April 1968. He was then with Cowdenbeath for a season before he emigrated to South Africa, where he continued his playing career for a spell before coaching for a few years. Tommy achieved the status of legend at United and he is ranked nineteenth in the all time appearances chart. Tommy was born on this date in Gorebridge. A six goal thriller on a snowbound Tannadice Park.